If you are still using a scripted download for CSV files in Google Search Console, be aware that Google will be turning off support for it on October 20, 2015. 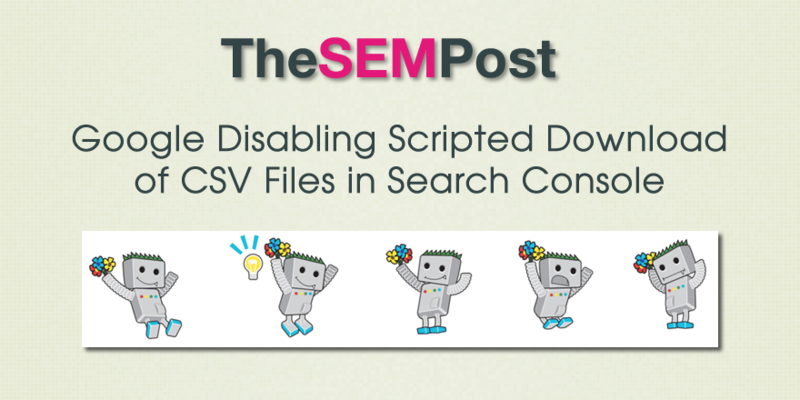 Google closed the old Google Webmaster Tools API back in April and launched the new Search Analytics API earlier this month, so the move to disable the Python scripted download for CSV files isn’t entirely surprising. It’s been a while since the introduction of the Python script to download search query data from Webmaster Tools in 2011. With the new Search Analytics API & the Client Login API deprecated, it’s now time to wind down support for the CSV download scripts. We’ll be turning off support for the scripted download of the CSV files on October 20, 2015. Users can use the new Search Analytics API for those who would like to automate the process. John Mueller provides some example code for those who would like to get started using the new API but don’t have the experience to do it yet. Google will disable support on October 20, 2015.